In the late 1990s I used Linux for the first time. 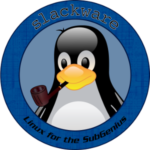 Back then, Slackware was one of a limited number of distributions on the market. Installation took very long and failed repeatedly. Partly this was due to my slow and unreliable internet connection, but my inexperience and incompetence were likely at least as detrimental to my progress. From what I remember I managed to set up X11 with the aid of a configuration script that asked me many questions to which I guessed most answers. I also found out how to make Linux talk to my external dial-up modem. No longer chained by evil Microsoft, I was very proud of myself. Unfortunately, there was not so much I could do with my new operating system. Its text editors (Emacs and Vim) seemed alien, X11 looked pretty ugly, my sound card played mute and games were hardly available. After a little while I applied for asylum in Redmond. In the years that followed, I dabbled a little bit with various Linux distributions on the side, but I believe it was only during my studies in the Spring of 2004 that I became a serious OSS user. I ran Red Hat (and later its community project Fedora), then Arch Linux, even FreeBSD and, briefly, Slackware before finally settling for Debian Sarge in the Winter of 2005. I stayed with Debian until last week. Somewhere in May 2015 I had upgraded to Jessie, the latest installment in Debian’s “stable” branch. This went reasonably smoothly, as expected, although after said upgrade I could only shutdown and reboot my computer from a console, as the corresponding XFCE menu options were no longer effective. (Indeed, selecting them would merely log me out and disrupt Network Manager.) However, things recently got worse after I attempted installing Evolution, an email client and organizer that is part of the GNOME environment. The next morning something went wrong when the graphical login manager tried to launch my desktop. A reboot into the console did not help much, for at this point my computer would suspend about every ten seconds, making it very difficult to diagnose the problem. After various clean re-installations and two BIOS upgrades (thanks to FreeDOS for providing the installation environment) and pending the offer of one of my advisors to let me use his old laptop, it occurred to me that systemd might be the culprit. The adoption of this comprehensive init system in Debian and other distros appears to have been controversial, but I am not qualified to hold strong opinions on systemd’s technical (de)merits. However, a clean installation of Slackware 14.2 resolved my problems beautifully. This is noteworthy, because Slackware is one of the few mainstream distributions that did not (yet?) favor systemd over sysvinit. Not only was my computer no longer narcoleptic, but Slackware also threw seamless configuration of X11 and my wireless card into the bargain. Slackware’s installer looked exactly like I remembered it from 1998 and it still boots into a console by default, yet the rest of the experience has been incomparable so far. I find it a very user-friendly no-nonsense distribution that seems to retain what is good and adopt what is better. I will keep an eye on Debian’s future developments, but for now I am relieved and grateful to have re-encountered this other grande dame of the Linux world. She looks better than ever before. This entry was posted in Computers, Opinions and tagged Debian, Linux, Slackware, systemd on January 29, 2017 by S.G. Janssens.